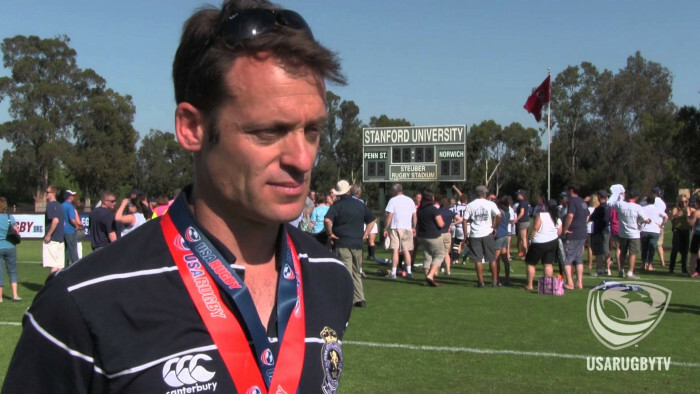 We talk to former USA Women's Eagles head coach Pete Steinberg about the future of the game, the development of rugby in America and what next for commercialising women's rugby. What do you see as the most challenging issues facing the women's game right now? I think the women’s game is very healthy and is growing. I am excited to see where the game goes next, but there are some challenges. I see the next challenge as the way to make the women’s game a product that can bring in revenue. This does require investment by World Rugby, the national unions and progressive sponsors. It also requires the broadcast partners to see the game as something that people want to watch. The World Cup, the Premiership in England and the domestic league in France are all demonstrating that fans want to watch women’s rugby. It is amazing to me that so few traditional unions do not see the women’s game as their main engine of growth. If they were companies they would all see the strategic advantage of investing in the women’s game to grow the game and the pot, but unions look at resources as fixed and therefore if you give money to the women you have to take it away from the men. Who do you think is adjusting best to this new era and why? I think New Zealand is adjusting the best and Australia is closing the gap. I think both of those unions seem to have a strategy to their approach to the women’s game and most importantly they are looking to create women’s rugby products, whether it is competitions or teams, and then using those to bring in new sponsors. I think what is going on with women’s sports in Australia is very exciting. Rugby is not really a major sport in that country, but women’s rugby could be and I think the ARU see that. France is also doing well in this transition because they see rugby as rugby regardless of gender. They get 10k people for their home tests when they hold them in the right places. I think it is also interesting that they have not centralised their 7s players. In the US, rugby is the only full-time residency program that the USOC funds that is a team sport. Generally you improve team sports by playing the sport, but rugby has removed 7s players from the domestic competition and now they do not play enough. How should nations who are struggling to balance the demands of 7s and 15s approach their programmes in your view? I think the idea that 7s and 15s are two different sports has some merit but I believe that they are more a like than they are different. I think an analogy that works is skiing. There are some speciality downhill skiers, some specialist slalom and some that do both. I think that that is true of most rugby players. I do think that separating the games right now for the women is doing both the players and the game a disservice. The main reasons for that are that there are not enough competitions for any player to be a 7s only player and because the talent pool is not deep enough to have 2 separate squads. In rugby, players improve the most when they are playing high level, elite games. The better the player the more elite the game needs to be for their development to continue. Taking a 7s player and not having them play 15s means that they get six weekends where they play high level elite competition. In 7s, even a starter could play 30 minutes in that weekend. Within that 30 minutes they could make just a couple of tackles. There is no way that is enough for someone to be a good tackler. It is not even enough data to know if they are a good tackler and what they need to work on. Play that player at flanker in an international 15s game and they could make over 20 tackles in one game - that could bee a season's worth of tackles in the circuit. You can know what they need to work on and they get a lot more repetitions. I can see how there can be challenges in having one pool of players, and Ireland got some blow back by trying to balance it through the 6 Nations. However I think that it is possible to do if you base it on both what you need to do to help the teams win, and what is best for the players development. What opportunities are there for the women's games in the coming years? I think there is a huge opportunity to commercialise the game. Women’s leadership and women as potential consumers are now big. EY’s sponsorship of the 2017 WRWC was by their talent group and that was to help them recruit women's rugby players because they see that background as an asset in the corporate world. I think that there is an opportunity to market the game on its own two feet. The 2017 WRWC games was technically and competitively excellent and exciting, and the 2018 7s World Cup showed that the women can produce high level games that are competitive. The women’s game does not need to be compared to the men - it is now an entertaining sport. I also think that the women’s game should be the growth engine of the traditional unions. If you want to grow the playing population in somewhere like Ireland by 20% you are not going to do it by getting more boys to play, but you could do that by recruiting more girls. More players means more interest which means more sponsorship money which means a bigger pot. You can see some very smart groups already doing this. I think the ARU now gets this, particularly when rugby is not a top sport there, and Harlequins seem to be pushing the envelope for marketing the women’s game. The Premiership teams would be naive not to see women as a way to increase attendance and revenue. I believe that World Rugby needs to see the women’s 15s game as an investment. They need to put money into women’s international competitions. They should also require unions have an active women’s programme if they receive development funding the way they require a boys U20 team to be active. I think that there is a movement for World Rugby to do more and the governance piece has been huge, but I also see a bit of a fixed pie mentality. Are the 'Old Boys' that sit on the council willing to give the men less so the women can have more? I think the risks are that unions use 7s as an excuse to ignore 15s. We saw the SRU try to do that a couple of years ago but fortunately they did not go a head with ending the 15s programme. Then they invest, and that investment leads to improved performance, and improved performance leads to increased interest and attendance and that leads to increased revenue. It is not that difficult to see how this could work for all the unions. The risk that 7s will take all the funding away from 15s is another challenge. In places like South America there has been a great emphasis on 7s, but we need to see more 15s. In the US, the USOC provides a lot of money to the 7s programme and requires the Union to match. However most Olympic associations believe in specialisation. It took a long time for the US to persuade the USOC that having 7s players play 15s would help their development. I have been to the AIS in Canberra and talked to High Performance people involved in rugby and they talk about 7s being a different game and it is not. The risk on the 7s side is that the circuit does not grow. Six stops is not enough, I believe there needs to be at least 10. However the model that World Rugby uses for the circuit makes it not attractive to host. On the men’s circuit most of the stops struggle to make money, and the women is a straight loss maker right now. Unless the business model changes, I do not see how this can grow to 10. What did the success of the recent WC7s tell us about how the game could be organised (7s) in the years ahead? I think having the men and women together has pros and cons. I think that the pros are that the women get better coverage, the cons are that they can still get the short end of the coverage. However I think that in the short term putting both genders on the circuit is good for the women. It exposes more rugby fans to the women’s game and generally when they see it they like it. So the long term plan should be for the next cycle to develop the brand of women’s 7s rugby by co-branding with the men through 2022 and then after 2022 once the women’s brand is strong enough create its own circuit. To get there there needs to be an investment to provide incentives with the current men’s hosts. Some just do not have the capacity to add the women, but those that do should be encouraged to do so. Were you a fan of the format? I like the fact that it was different than the Olympics. I saw it more like the difference between a league competition and a cup competition. I understand why coaches hate it, especially with 7s having such a large element of luck. However if you look at the quarterfinals most of the top teams were there, with only Ireland’s win over England being an upset. But that happens in pool play too. You said that the teams who aren't competing on the circuit just can't compete anymore - how should the game's powers improve things? This is very much a chicken and an egg challenge. I think it is interesting that World Rugby is looking to expand the men’s World Cup when there are blow-outs as a way to grow the game, but the women’s World Cup is stuck. Basically we need competitions to be able to grow the game and that means we are going to have to have unbalanced games. We need to think beyond the four year cycle and think about 10+ years. How can we get a team like Jamaica, which has some great natural ability, to be able to compete? We need to give them competitions. If you create competitions, then unions will support their programmes and then they can improve. I think an expansion of the circuit, or a second team circuit - which they have created in Europe - is needed. How do you think the US women's programmes are shaping up at the moment? Both programmes are going through transitions and both 7s and 15s are in the same position - top team but not top three. I have concerns that the new coaches will require a choice by players to play 7s or 15s and I think that is a mistake. We need more funding, but there is a movement within USA rugby to find both commercial sponsors that are interested in the women’s game as well as the women’s community working hard to look for fundraising options. We will struggle in 15s without finding a way to professionalise the players with the other unions stepping up. Is the game there on the rise/growing and becoming more well known? The big change in the women’s game has been the explosion of varsity women’s rugby in colleges. This has happened for two reasons. Either, it is a Title IX issue. Title IX is a gender equity law that requires any University that gets public funding to provide equal opportunity for men and women. This is true throughout the University but is most famously applied in sport. There have been some lawsuits which have created varsity program and also some schools have added women’s rugby because it is a cheap sport to get numbers of female athletes (when you consider other sports like rowing, the costs of rugby are very low). Numbers of varsity athletes is one of the ways a University can be compliant and American Football teams have over 100 players and there is no equivalent sport for women. Interestingly because this is a numbers game 15s is much more important here than 7s. The other part of the explosion of varsity college teams has come from admission challenges. There is a declining student population so smaller schools are looking for ways to attract student to their campus. Some see rugby (both men and women) as a way of getting more students to apply. This is generally with small schools that do not have Title IX issues (just a few thousand students) and they have recruiting requirements. Scholarships are available but only if rugby brings in non-scholarship athletes. So a team might have 30 players on their team with 10 on scholarship as an example. This has created a new professional career path for coaches and an opportunity for elite level play and a scholarship for players. This really helps drive high school girls rugby because parents are interested in their kids getting scholarships (the cost of University for even at a public school can be over $100k for the 4 years and that is only tuition). However many of these new programs promoted the local coach and are not run well and not really elite. It is creating some confusion within the high school community. The end goal is NCAA recognition which will come with minimum standards. That takes 40 schools and we are probably around halfway there. However some of the top colleges have come together to form NIRA, which is really a pre-curser to NCAA recognition and follows many of the standards of the NCAA. NCAA recognition for women’s rugby is a game changer in terms of recognition and in growth of the game. The NCAA women’s sports are the primary development vehicle for many of the USA olympic teams and that will be the same for rugby. The US seems much better than the rest of the word at marketing its leading players to promote sport - in players like Naya Tapper does rugby now have a big chance there now to get some more cut through? I think that American companies are much more interested in using female brand ambassadors and I think the women’s 7s team players are doing a nice job of building a following. Athlete stories are always important in the US and is a key way for the athletes to develop additional revenue. The time is ripe for the women’s game in the US to become a revenue generator.